Summary: A hot-air balloon ride gone wrong lands Oliver, Mya, and Jorge on a mysterious island inhabited by dodo birds and Vikings. The dodos are entertaining and companionable, the Vikings, not so much. Not only are Erik the Red and his band after the kids, but Octavian, the balloon’s pilot, wants the magic map they took from him. After a daring prison break and a series of exciting chase scenes, the three children manage to outwit them all and sail off in a Viking vessel. The trip home promises an exciting sequel. 112 pages; grades 1-4. 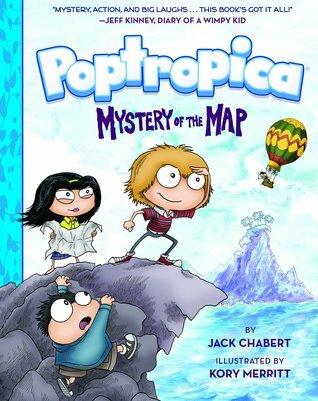 Pros: This graphic novel is based on the Poptropica website, a gaming site co-founded by Diary of a Wimpy Kid creator Jeff Kinney. All the kid-friendly elements are in place to make this a surefire hit with even reluctant elementary readers. Cons: Is it really okay to have a positive Jeff Kinney blurb on the front cover a book based on a website he helped create?